I have started and stopped writing this post several times. I had to make sure each time that I was writing it out of a desire to educate and not to be passive aggressive. I am human, after all. But know that this post is not directed towards anyone specific, only intended to address some common criticisms – and memes – that I’ve seen. In 5th grade I began attending a church for the first time with any regularity. I quickly formed a deep bond with the pastor’s daughter and we remained best friends for years. There were months at a time where I actually even lived with them, my best friend’s family, the pastor of our church. When I met the (super hot) man who would become my husband, I was 16 and he had recently become the children’s pastor at our church. We married when I was 19 and he was on staff full-time at a very large church. Now, almost 12 years of marriage later, we are still in full-time ministry. It’s all we’ve known as a couple, it’s all our kids have known as a family. My experience with ministry spans decades and denominations, positions and places. I’ve both witnessed it and lived it for the majority of my life. I also live in this modern society. I see the posts, the memes, the comments, the assumptions. I hear the complaints and the criticisms. I listen, I do. I don’t dismiss them as the ramblings of godless pagans (sarcasm font). As someone who passionately loves Jesus, it does me no good to write off an entire generation of people simply for having different beliefs than I do. But also as someone who loves Jesus, it does me no good if I don’t try to present the truth about what seems to bring up such strong negative feelings in so many people – the church. I don’t want to argue. I don’t want to taunt. And I certainly don’t want to use this platform as a chance to passive aggressively discuss how hard ministry is – I’ll openly tell anyone that, haha! I just want to take this opportunity to do my part to dispel some rumors and myths about churches and pastors, to the best of my ability. I obviously don’t speak for all churches or pastors, and there will of course be some who don’t adhere to the same beliefs or practices. There will also always be some bad apples in a bunch, regardless of profession or location. So I ask that you read this with an open mind and an open heart, willing to hear some truth about an institution you may have been hurt by or misinformed about. My intent is never to attack anyone, only to help. We totally do. I’ve seen the meme making the rounds for years now, images of Joel Osteen’s or T.D. Jakes’ or Ed Young’s enormous homes, pointing out the assumed hypocrisy of their wealth and not paying any portions of it to the government like everyone else has to. And while I understand how many, many people would be turned off by those pictures, I guarantee you they paid taxes on whatever they earned to buy those homes. Pastors are considered self-employed for tax purposes and have to put aside their own taxes throughout the year, they aren’t automatically removed from paychecks. We’ve written our share of checks to Uncle Sam in April, believe me, pastors pay taxes. CHURCHES do not. Churches are nonprofit organizations – they literally do not turn a profit. Every cent that is given to a church is processed right back out of it, like the ACLU, Doctors Without Borders, NPR, American Red Cross, ASPCA, St. Jude’s, Make A Wish, Ted Talks, Ronald McDonald House, Planned Parenthood, PBS, the Mayo Foundation, AARP, American Heart Association, the Humane Society, Susan G. Komen, Alex’s Lemonade Stand, Habitat for Humanity, American Cancer Society, Amnesty International, and countless others. These foundations and organizations work on behalf of others using donations to operate, the same as a church. Employees of these organizations all receive a salary, but their salaries are set and are not impacted by the amount of donations received… unless the donations stop coming in. Just like a church. Simply to add more clarity and definitely not to defend, Joel Osteen does not receive a salary from the church he pastors. He, like T.D. Jakes and Ed Young, writes books. Books that sell millions of copies and generate a lot of taxable income. To summarize, pastors pay taxes, all nonprofit organizations do not. They do ask for money, in the form of tithes and offerings. As a nonprofit, a church cannot operate unless money is donated. Electric bills that ensure lights and air conditioning, phone service that allows people to call the church office, employees to answer the phones, clean the church, mow the grass, and, you know, minister. In addition to just the common operating expenses, churches GIVE. They pay bills for those who come to them in need, they support missionaries around the world, buy school supplies for single moms, foot the bill for enormous outreaches, food ministries, homeless ministries… the amount of people a church can bless is only limited by the funds they receive. Aside from the Biblical call to tithe, if a church member wants to experience church, they must acknowledge that it costs to run that church. If they want to see that church do more, someone has to give more. In our denomination – and I know not all operate this way – churches are autonomous. Our church does not receive funds from a central office or district manager. What our church brings in is what our church operates on. Many, many churches are not supported by higher-up offices and do not have free reign or blank checks when it comes to spending, so if a church is going to pay a bill, it has to have the money in its own account. It’s a proven fact – the bigger the church, the bigger the reach. A church that seats 5,000 can do more than a church that seats 30. Neither is better than the other, neither is more holy. But when a church is more visible, it reaches more people. When a church has more tithing members, it has more funds to give, to send, to share. When a church can hold more, there are more opportunities for people to find someone to connect with. When a church has a large operating budget, it can afford programs and ministries during the week. You don’t have to like them, you don’t have to attend them, but mega churches are not inherently, automatically evil. A room full of thousands of worshipers is a mighty thing for a community, not a symbol of greed. 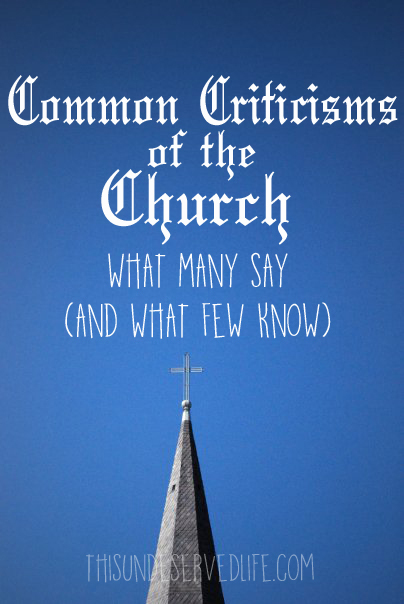 It’s crass, but the bigger the church, the more money it brings in, the more it can do. Jesus preached to thousands and it didn’t make him a sellout any more than preaching to one woman in the dirt made him ineffective. Christian crowds come in all sizes and shapes and numbers, and their reach is greatly increased when those sizes grow. The less a church receives in tithes and offerings, the less it is able to do. Electricity is not free. Food to hand out to the homeless is not free. Childcare for single mothers is not free. This is one of the most frequent criticisms I see of the church, a list of things people think the church should do, and every single time it is in the same breath as a complaint about pastors asking for money. EVERY. TIME. Divorce ministries cost money. Bibles cost money. After school programs cost money. Blankets, hot chocolate, gift baskets, anything kind you could think to hand out to someone – they all cost money. Counselors on staff cost money. Events cost money. Easter eggs full of candy cost money. Even filling up a baptismal costs money. Churches have to have money to be able to provide the things and services so many think they should, the things and services the Bible says they should. This is one of the biggest reasons people leave a church – offense at the pastor. I even know a few friends who are vocal atheists who have said the turning point in their faith was something a pastor did. It’s a big deal when people are hurt by their shepherd, and I’m in no way excusing or condoning the actions of some very flawed people. But I will address this frequent complaint, if you’ll allow me. I’m just going to say it – attending graduation/anniversary/birthday/lawn clipping parties is not biblical. The Bible has some very clear guidelines for those in ministry, and modern society has added on a very long list of expectations. It is impossible, truly impossible, to meet them all, to attend everything, to keep everyone happy. In addition to the wants of the congregation come the needs of a family. The Bible makes multiple mentions of pastors caring for their families, this isn’t selfishness. I can tell tales of 7am Saturday phone calls demanding my husband attend someone’s game, of graduation seasons when I don’t see my husband for weeks. There is always, always something to do, which means that pastors can’t always, always attend. They are very busy people attending to the long list of responsibilities and expectations laid before them, and sometimes items just have to drop off the list. Not because they don’t care, not because you’re not special, but because they just can’t do it. So I ask you, when you’re offended or upset that a pastor hasn’t done something or made an appearance somewhere, ask yourself if your offense is biblical or personal. It’s a hard pill to swallow sometimes, but it’s a lot easier than holding onto bitterness and offense. I had to take a break to compose myself, I was just laughing way too hard to type! Okay, I’m back. One of the main questions my husband gets from young people is, “What do you DO, like, for a job?” They all assume that he works somewhere in an office, 9-5, and is able to toss together a service in his spare time. In truth, I don’t know of a single day he’s worked 9-5. Pastors are really freaking busy. When I lived with my best friend so many years ago, I was so surprised at the number of messages on the answering machine any time we got back from an errand. People calling at all hours for prayer, for help with a bill, hoping for a visit in the hospital, wanting to tattle on and complain about another church member. Two of my husband’s favorite hobbies are golf and fishing, neither of which he’s been able to do in a few years. Budgeting, board meetings, counseling, hospital visits, staff meetings, sermon prep, video prep, service outlines, more hospital visits, meetings with church members, taking phone calls, meeting people at whatever utility office they have an unpaid bill at, mission trips, outreaches, camps, event planning, volunteer recruitment, volunteer follow up, begging volunteers not to quit, visitor follow up, praying, not to mention the pastors who are responsible for cleaning the church, mowing the lawn, and doing the work in the community no one sees – there is not enough time in a week to be a pastor. If ever you’ve driven past the church and not seen my husband’s car, it’s not because he wasn’t working, it’s because he was out taking the church somewhere it was needed. We get phone calls, texts, and emails on “days off”, on our trip to Disney World several years back, and even during family members’ funerals. The work of pastoring is never complete and rarely seen. Recently my family left a church event we were enjoying because a man no one had ever met came through the doors in need of money for a prescription. We all loaded up and followed him to the pharmacy and paid for his medications… only to drive past his car in the parking lot of a restaurant a few minutes later. Pastors are always doing. During the first few months of school my husband is so busy that our kids can go days without seeing him – despite the church only being 10 minutes away from our house. The number one fight among all of the married couples I know who are in ministry, by far, is fighting over how much the pastor is gone. Pastoring. It’s a never-ending job, shepherding the flock, and the sheep rarely realize that the pastor is not with them simply because he’s with someone else. Definitely not because he’s on the golf course. This has a smidgen of truth to it. Not that anyone is elite, not that pastors don’t care, but that pastors are a little hesitant. First, there’s the time issue – pastors have very little, if any, free time. Nights out with friends don’t happen. Going to the movies doesn’t happen. Guys’ camping trips don’t happen. There really isn’t much time to hang out with ANYONE, so they often fall back to the friends who have proven to be understanding of their schedules over time. There is also a fear of being a status symbol. A lot of people want proximity to a pastor, not a relationship with them. The same for their spouses and children. The number of people who have declared devotion to helping my husband, who have proclaimed a dedication to praying for him and being his “armor bearer”, outnumbers the actual number of people in our lives… by probably 20 to 1. It’s just a fact that not everyone stays in a church, and it’s a fact that people hold pastors to an often-impossible standard. Add in the fact that people are imperfect, and you have a lot of hurt pastors who are lonely and afraid to let new people into their private lives. The statistics on pastors struggling with depression and loneliness are staggering. The numbers on pastoral burnout are worse – the overwhelming majority of people who enter into full time ministry will walk away from it, for good. Pastors have their own struggles and are often unable to share them with friends for any number of reasons – fear of judgement, fear of their confidence being betrayed, fear of being used to boost someone’s social standing. No one in church is elite. There’s not a list of the members who give the most money, and tithing doesn’t buy an audience with anyone. It IS hard for pastors to find friends among the congregation, but usually because they’ve been hurt before, not because you’re not rich/cool/young/old/involved enough. I once met a woman who left her church because her pastor didn’t approach her son with whom she was feuding. The pastor had no idea the argument was ongoing, the son didn’t attend the church so the pastor didn’t know him, and the woman never asked him to intervene. While pastors do hear from God, they can’t read YOUR mind. If you need something from a pastor, let them know before you criticize them for not providing it. Pastors have jobs, families, commitments, all the things anyone else is juggling, IN ADDITION to being needed everywhere all the time. If your hope and expectations are always in your pastor, you will always leave disappointed. The goal of a pastor is to introduce you to Jesus, not himself. Jesus is way more available whenever you need Him, too. Okay, okay, stop! I can’t catch my breath with these jokes you’re making! Whew, that was a knee-slapper if I’ve ever heard one! Yes, some pastors make a crapload of money. Yes, some pastors live well. But most live very, very modestly. An enormous number of pastors are even bi-vocational – they work a paying job in addition to the low-paying or volunteer position of pastor. Most denominations do not offer parsonages – I’ve only ever met one pastor who lived in one. Our housing is not free, our bills are not free. There have been many times where we’ve had to collect groceries from the church’s food ministry or food bank. We rarely get Christmas bonuses. My kids qualify for free lunch at school. All of our bills are due the same time as anyone else’s, we definitely pay taxes, we experience the same raise in the cost of living, yet many pastoral salaries have actually DECREASED over the years. Because of the nature of his work and the hours involved in always being on call, my husband cannot get a second job, and he does not earn overtime pay. I read a hilarious satirical article I’ll link here, and it will tell you everything you need to know about the attitude often held towards pastors and money. Without going into too much more detail, we really, truly, do not get paid a lot. Our salary is set by the board and does not fluctuate with attendance – though a downward trend in giving and membership will absolutely lead to a pay cut, simply because the money isn’t there to pay the staff. No one goes into ministry for the money. Yeah, actually. We’re all imperfect, flawed, sinning people. We’re all doing our best. We’re all at some point in our spiritual journey – none of us are done. We’re all going to do the wrong thing sometimes, we’re all going to offend someone, we’re all going to stumble, fall, mess up, and look like the worst Christians alive. There is no such thing as a perfect Christian. So if you enter a church, be prepared to meet some seriously imperfect people. Me, especially. I’ll stop you right there. Homegirl is holding down the fort. She cannot be Your Pastor 2.0. Pastors have families, illnesses, bills, homes, tragedies, struggles, yards, laundry… they’re normal people. Just as the pastor can’t always be at everything, neither can his wife. Just as he will disappoint you sometimes, so will his wife. Just as he can’t always hang out with you, neither can his wife. They’re a team, no doubt. What he does couldn’t be accomplished without the help and support she offers at home. So again, examine your offense before you declare yourself to be wronged and ask if you had the same schedule and circumstances as she did, would you have been able to do what you expected of her? Years ago, my husband started a new job. It was in a new city with much better schools and a too-long commute that cost us almost as much in gas as we were paying for our mortgage, so we made the obvious decision to move. We listed our home and prayed for the best. Then the real estate bubble burst. We landscaped our home. We painted our home. People came, walked through, and left. We updated fixtures. We steam cleaned the carpets. Still no one wanted our home. We welcomed our second child and brought him home to a bare nursery, convinced we’d be moving soon. We lowered the price. We switched realtors. We tried Craigslist. We lived among boxes with no decorations on the walls for almost two years, always at the ready to be gone, move on. But no matter what we did, no one wanted our home. What we’d bought it for and what it was now worth with 7 foreclosures on the same street were just too far apart. No one was qualifying for home loans – fewer were even looking to buy. We waited, prayed. We had one car so I would be home all day with two boys, a baby and a toddler, with no transportation. My husband would leave in the morning while it was still dark and not get home until it was almost bedtime for the kids. We spent so much in gas that we had to get groceries from the food pantry. Once, my oldest son pulled a classic toddler move and busted his eyebrow open, obviously needing stitches, but I was alone, my husband was at an event over an hour away and didn’t have his cell phone on him. There were times the four of us slept in his office to avoid having to make the drive back home before another service or event. It was bad. We wanted so badly to be out of there, to get on with our life, to be rid of something that was once such a source of pride for us, but no one was buying. Years before that, far back in my college days, a psychology professor of mine told the story of the time he was pastoring a church and several people brought a member to him, someone in need of immediate prayer. They believed this person who was foaming at the mouth and convulsing to be possessed. My professor immediately recognized that they were having a seizure. Even longer ago, Jesus slept on a boat. A huge storm came up, waves crashed, and the elements threatened to capsize the boat. Terrified, the disciples with Jesus woke Him, who promptly spoke to the storm and calmed it. What have I learned from these accounts? Sometimes it just storms. Sometimes God works in mysterious ways, sometimes His will is obvious, sometimes God closes a door and opens a window. And sometimes it just storms. The disciples on the boat with Jesus, rocking with the waves, feeling the spray in their face, seeing the clouds and clashing all around them, cried out, asking Jesus if He even cared if they drowned. They saw trouble and assumed it represented an emotion or intention on the part of God. Even though they were with Him, literally right next to Him, able to see Him and know He was real and with them, their first thought was that He was against them, or at least indifferent. How often we count ourselves in God’s company and begin assigning His will to storms, all the while forgetting his ability to calm it. Sometimes it just storms. Not because God is trying to drown you, not because God is trying to stop you, not because you haven’t prayed enough, but because it just does. What would happen if, instead of crying out, “God, why is it storming? !” we steely spoke, “God, calm the storm.”? If we saw trouble ahead, found ourselves in the midst of hardships, and rather than seeing ourselves as victims of a God who has forgotten us, we remembered what He can do for us? When Moses led the Israelites out of Egypt and they came to the Red Sea, they were forced to stop. Did Moses cry out, “God must have led us here to be slaughtered!”? Did he look at the water and say, “Welp, I guess all those plagues were off the mark – we probably should have stayed behind in slavery.”? NO! God did not put the Red Sea in front of them to stop them, He put it there to EMPOWER them. Because when Moses came to that water, the seeming dead end, he did not stop and whimper that it must be God’s way of stopping them, he lifted his hand and with the power of God saw those waters part. Suddenly what was once an obstacle was a pathway. What could have been interpreted as the end became an unmistakable beginning. 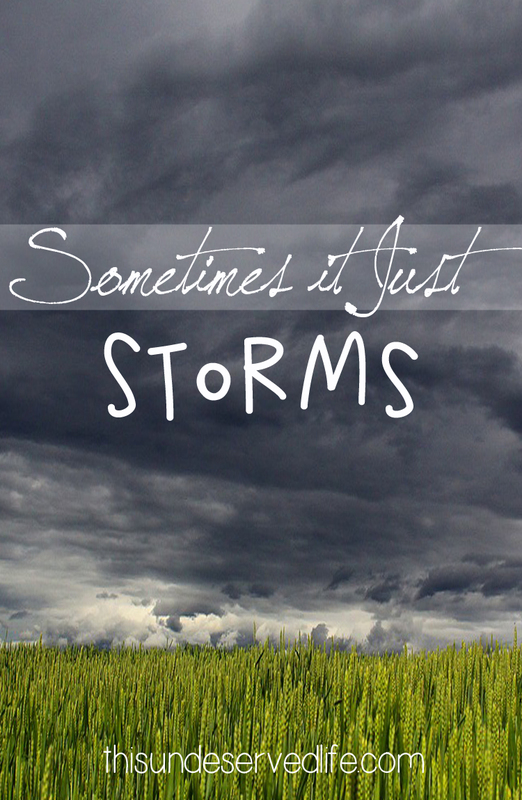 Sometimes it just storms, sometimes there’s just stuff in the way, but every time God is able to overcome it. Yes, sometimes bad things do happen because of the hand of God. Job is an example who easily comes to mind. The Great Flood was never just a storm. But look also at Joseph – sold into slavery, falsely imprisoned, the guy had every reason to think God’s will for his life wouldn’t come to pass. “It’s kinda dark in this pit my brothers tossed me into, I guess those dreams probably meant something else.” NOPE. Jacob, a man who literally wrestled with God, could have tapped out, could have justifiably thought God just didn’t like him, but would not let go until he got the blessing he KNEW God alone could give him. He walked away with a limp, but sometimes limps happen. A limp doesn’t mean God didn’t bless you – heck, in Jacob’s case it was proof that He had. Because as much as someone can walk away from Jesus healed and whole, they can walk away from God limping and still have been blessed. Because as much as God can bring a flood to destroy, He can calm a storm to save. Because sometimes He wants to do something, sometimes He wants to show us or stop us or teach us or lead us. But sometimes it also just storms, and He has no motives. Jesus didn’t cause the storm on that day He was in the boat. God wasn’t smiting anyone. It was just a storm. And misinterpreting it did nothing to God’s abilities to calm it. God has a voice. He speaks to us. It is not up to us to interpret what we see around us when we have every right to just ask Him ourselves… if only we’ll listen. If only we’ll stop looking for signs and just listen for guidance. If only we’ll stop assuming that everything happens for a reason. If only we’ll remember that the God who creates storms is also able to calm them. If only we will listen in patience instead of blaming in fear. If only we will pray with mercy rather than judge another’s storm. God is powerful, He’s mighty, He’s able and always, and yes, He can create a storm, be it in the form of weather or circumstance, rain or consequences. What He isn’t is mute. He does not only speak to us through trials and high winds. Do not be so quick to assign God’s will to an event that we give the storm more power than His voice. Listen to Him, not the rattling windows. Blame the wind, not the Father, when it storms. Stare up into the heavens, beyond the wall of clouds, and rather than wait to ride out the storm you think you’ve earned, call out to the One above it who can calm it should He desire. Or just let the rains wash over you, because sometimes it just storms. So no, I do not think that God crashed the entire US real estate market to keep us from selling that house. He’s able, sure, but I don’t think He did. God’s pretty cool about making His will known, about speaking to His children. And I refuse to listen to the storm around me tell me what God wants to do when I could just ask Him myself. Because as you know, sometimes it just storms.